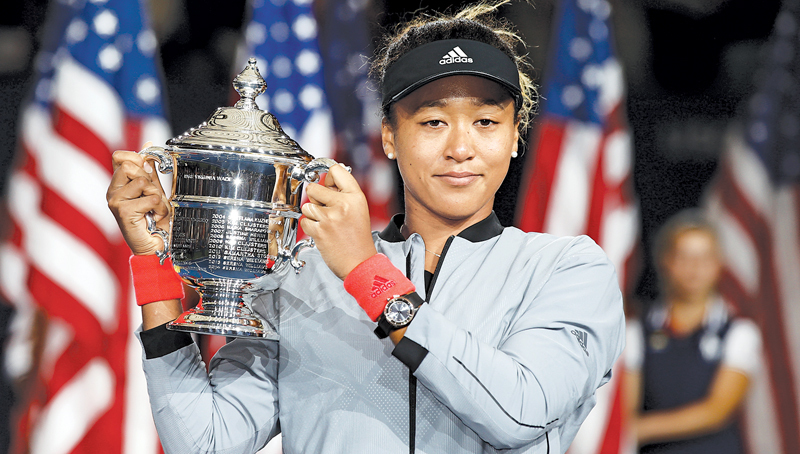 TOKYO, Sunday - Japan on Sunday hailed Naomi Osaka's stunning upset against the legendary Serena Williams to win the US Open, giving the nation some rare good news after a summer of deadly natural disasters. “I hope she stays healthy and continues her good work. I also hope she wins at the Tokyo Olympics (in 2020),” he said. Fellow tennis star Kei Nishikori flooded Twitter with emojis of trophies, thumbs up and Japanese flags, followed by a simple tweet of “proud” alongside a Japanese flag. And Tsuyoshi Fukui, a former top Japanese player and now senior official at the Japanese Tennis Association, said Osaka's performance would help to cheer the country up after typhoons, floods and earthquakes dominated the headlines this summer. Osaka's “tenacious and patient performance ... must have been a great show of encouragement to those Japanese people who saw damage from such things as typhoons and earthquakes,” Fukui told Japanese media. Sports Nippon newspaper said Osaka had achieved a “complete victory” against an “irritated Serena who broke her racket”. The Asahi Shimbun daily said on Twitter it would be printing an extra edition and distributing it in Tokyo.